Photography arrived in the United States circa 1839 thanks to the newly invented daguerreotype process. A daguerreotype has no negative so if you find a daguerreotype you know you have a one-of-a-kind image. They look like a mirror and the images jump out at you, appearing very 3 dimensional. By 1854 Ambrotypes had entered the photography scene and were widely used. The ambrotype was a glass negative backed with black material, which enabled it to appear as a positive image. The ambrotype was much cheaper than a daguerreotype. 1855 saw the introduction of the Ferrotype process (commonly called tintypes) in the United States. 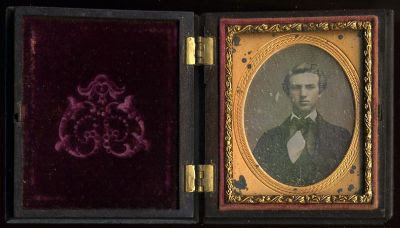 It substituted an iron plate for glass and was even cheaper than the ambrotype. Then came the CDV. 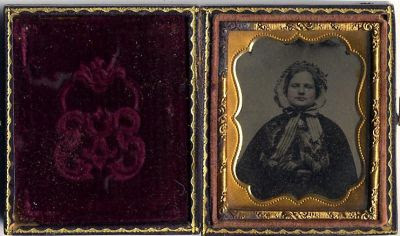 CDV stands for carte de visite, meaning a photographic calling card. 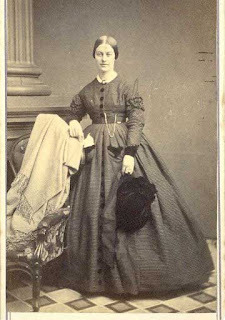 The CDV process began in France in 1854 and rapidly replaced the old glass images of the ambrotypes, producing a card the size of the then standard calling card, around 2.5 x 4. The CDV process produced a negative from which any number of prints could be made. CDVs arrived in the United States around 1859, on the eve of the Civil War (1861-1865). Demand for CDVs was high, as soldiers and their loved ones sought an affordable image of remembrance. Special photo albums were designed especially for cartes-de-visite. Several years ago while prowling through a local antique store, I came upon a gorgeous leather photo album full of beautiful old portraits. (I would later learn that they were called CDVs). Most of the photos were identified with names in elaborate old handwriting and that also caught my eye. Holding a CDV in your hand is like holding a window to the past and I couldn’t walk away from that album. I wanted a better glimpse through that window. I was fascinated by the people and consumed with wanting to know something about them – when they were born, who they married, did they have children, and so on. As an avid genealogist I figured I could probably find out more about the subjects of the photos and that would be my look through the window into their lives. That was the start of what was to become a huge collection of albums and CDVs. was in may be the album on the left in this photo. 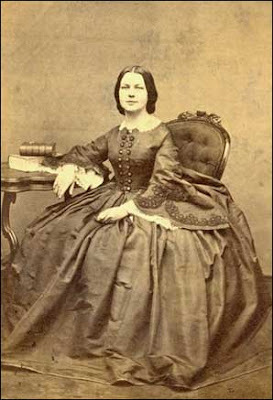 Gradually my interest became focused on women during the Civil War era. I felt a kinship for these women and wondered what lay hidden behind their stiff faces and formal poses. 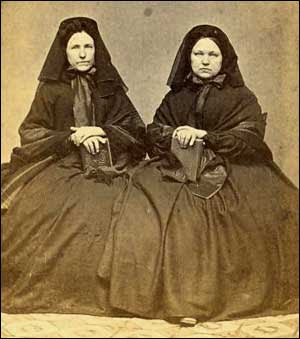 I am fascinated by the customs and traditions that women followed during the time period of the Civil War. Their clothing, their hairstyle, jewelry and even their poses reflect the social nuances of the times. Children’s portraits of this time period also intrigue me, as during the Civil War era they were dressed as miniature adults. One of my rarest finds is a CDV of a young child with his rocking horse. It is rare to find portraits of children with their toys or familiar objects, for they were expected to behave as adults and stand or sit very still during their sitting for the photographer. There are few casual photographs, people were most often posed formally for their photos. 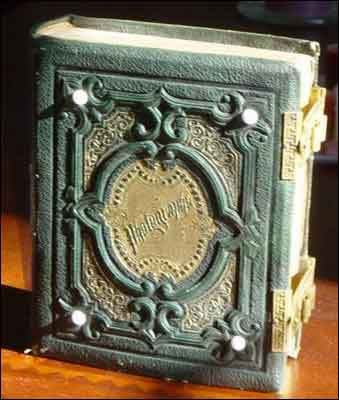 Often women hold an actual CDV Civil War album, or a book. But rarely is it a personal item with meaning to the individual. 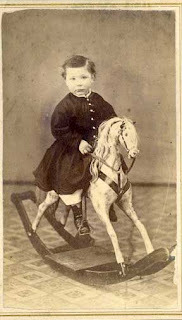 Photograph: Very early CDV of young boy on rocking horse. Even though he is in a dress he is almost certainly a boy because of the side part in the hair. Girls' hair was parted in the middle. 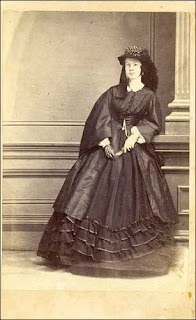 You can see some examples of Civil War era fashions in CDVs at Olive Tree Genealogy Fashion Photographs. Collectors of cartes-de-visite often have one or more prized Civil War photographs that have revenue stamps fixed on the reverse side. An Act of Congress passed on June 30, 1864 added a new tax on all "photographs, ambrotypes, daguerreotypes or any other sun-pictures" to be paid for by attaching a revenue stamp on the back of the photograph. Because these stamps were only required on photographs from 1864 to 1866, their presence (or absence) gives us the approximate dates of photographs of the Civil War era. Often the photographer dated the revenue stamp which gives us an exact date the photograph was taken. 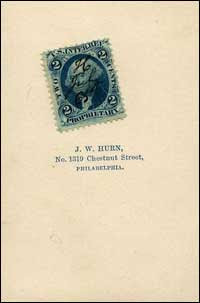 Photograph: An example of a dated revenue stamp. 26 July '65. How else can we date an old CDV? From 1859 to 1872, CDVs had square cut corners. After 1872 corners were rounded. There are other signs to look for - in the 1860s the backs of CDVs were very thin, often they were layers of paper or cardboard. By 1870 the backs were thicker. older woman is rather unusually posed in all her outdoor finery. 1860s or even late 1850s. I always check the back (verso) of a CDV because the photographer’s mark can provide great clues to its age. First, when was the photographer in business? Look for the photographer's printed address on the back of the card, then research the known dates of his studios. The first thing I do when I bring a CDV Photo Album home is to photograph every page of the album, including covers. I want to preserve the images of each CDV as they are placed in the album, as I will be removing the CDVs from their mounts and album pages. I also assign the album a letter combination (usually the first 3 letters of whatever family name is most prevalent in the album). Next I carefully remove each CDV. This requires a steady hand and great patience. You must find tools which work for you and which will not harm either the album pages or the CDVs. It is a laborious task but cannot be rushed. As I remove each CDV, I assign it a number-letter combination and record its details from both front and back (verso). Each album is labeled in pencil in the back inside cover with its letter combination I have given it. I also number the album for a binder I keep with a paper record of each album, its number, its letter combination designation and a list of all the photos from it. After carefully removing all the CDVs and other images from the album, I either display it in my collections cabinets, or I put it in storage for the possible day when I might reunite the original photos and the album again. For example some museums have expressed interest in specific albums in my collection. Those will have their CDVs placed back in the album in the original slots, and then it will be donated to the museum at some time in the future. Once all the CDVs have been removed and cataloged, I begin scanning them. I scan both front and back at 300 dpi. After the technical work (removal of CDVs, assigning numbers, recording details, scanning) is complete, I get down to the fun stuff – dating each image as best I can. This can take hours or days for each image. tightly pulled back to cover the ears. This CDV may be from 1870-1872. I then store each image in acid-free plastic sleeves and with a special pen, I mark on the sleeve the letter-number combination I have given the image. This allows me to find all images that belong to a specific album at any time in the future. I also note the estimated date I believe the photograph was taken. This allows me to sort the CDVs into any type of grouping I choose – by date, by subject (men vs women vs children vs soldiers, etc), by type of pose (standing, sitting, head and shoulders), by photographer – the choice is mine. I usually sort into men vs women vs children vs families vs couples vs soldiers, then by type of pose (standing, sitting, head and shoulders), then chronologically. 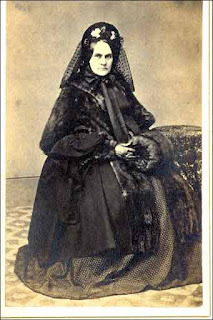 Photograph: Beautifully gowned woman in Civil War period. The sleeves are full and wide, and artfully arranged to display at their best. 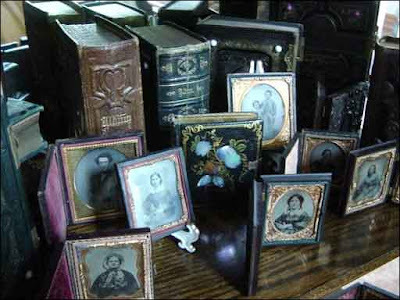 A Civil War era Photo Album sits on the table. When I first decided I needed to organize my collection of over 3,000 CDVs, I used special archival binders with acid free sheets, each sheet holding 9 CDVs. This did not work well as it meant I could not label the outside of each CDV pouch, as I might later wish to rearrange the order of I might find another CDV that needed to be inserted in the middle. For me, individual acid free clear sleeves work best for sorting as I can label them and rearrange the order easily. I spend hours poring over these beautiful photos of times past, thinking about the people forever frozen in a moment – people who lived, loved and cried just as we do. My hope is that I’ve preserved them for future generations of descendants who will cherish them as I do. You may purchase reprints of any ancestors you find at Olive Tree Genealogy. Feeling lucky? Albums may be viewed online at Lost Faces. A most excellent post - so much I didn't know about early photography and you provided not only facts but visuals. Thanks! What a fantastic post! I can't tell you how much I enjoyed this and am going to bookmark it for future reference. Wonderfully informative! I really leaned a lot. 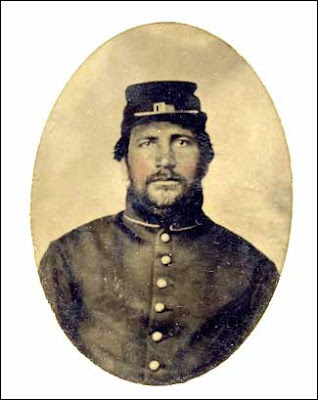 I have been trying to figure out a civil war photo in a collection I was given to look through. I now know that it is a Ambrotype. I had no idea before. Thanks fM for inviting Lorine as your guest collector. Lorine, you have a wonderful collection of very special photographs. I enjoyed looking at them. Thanks for sharing your expertise, thoughts and feelings about them. BTW - we are distantly related through the Van Slyke family. Thank you everyone for the kind comments! I love looking through my photos and wish I had more time to spend on this fascinating hobby. And Kathryn -- that is very cool about our Van Slyke ties! 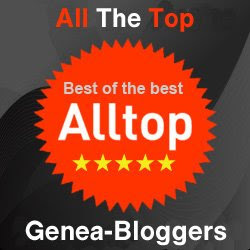 A great post! Great images! Thanks for sharing!